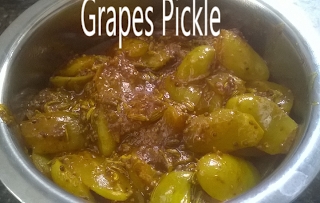 Instant grape pickle recipe, sweet, sour, spicy. An easy pickle that can be prepared just in 10 minutes, a perfect side dish for curd rice or paratha and ajwoin puri. Method 1.Wash, pat dry grapes and slit into two pieces.